The easiest way to make a bootable Linux thumb drive is starting with an ISO of your favorite distro’s live disc. 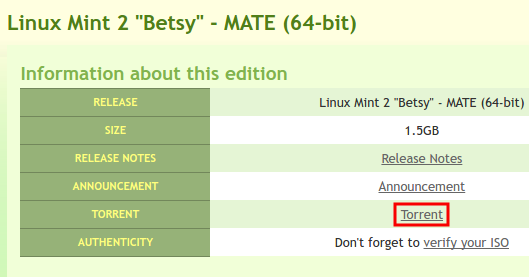 People keep giving me grief about not bothering with the MATE version of LMDE, since I prefer Cinnamon, so I decided to download the ISO for that as subject matter for today’s post. Also, always be sure to verify the ISO. Remember when the Mint site was pwned and a backdoored version of the OS was substituted? Yeah. Pay attention to this and make sure what you download is the real article, and has not been compromised. As a side note, at 1.5 GB, yes, one could just as easily burn a DVD of this ISO using whatever DVD burning application one prefers. But that’s a waste of a DVD, and people don’t always have those lying around these days. But thumb drives are still pretty ubiquitous, so let’s give it a try. Make sure it’s a big enough thumb drive to handle the ISO. Insert the target thumb drive into one of the USB ports on your PC. I probably shouldn’t have to tell you that if you have anything important on it, you need to make a backup copy of it NOW, because if you proceed past this point and don’t, that stuff will be gone. This process wipes out anything you may have on that thumb drive, and replaces it with a new filesystem and contents of the ISO in question. The only part of all of that I really care about is the part where it starts listing sdb partitions. That tells me that Linux is seeing USB devices as /dev/sdb. What does that mean? That’s probably a topic for a different post at some point; suffice to say that in Linux, every piece of hardware is a file in /dev. If a USB drive is identified as /dev/sdb then the partitions are designated as a number after that device — /dev/sdb1, /dev/sdb2, et cetera. For our purposes, we don’t care about any partitions on this thumb drive — we only care what the drive itself is called, and now we know. The next step, now that you have your ISO file and you know what your machine is calling your USB thumb drive, is to actually write the image to the drive in a way that extracts it and makes it bootable. We’re going to do this with the venerable dd utility. Some of this may seem hard to follow at first if you’re new to this kind of thing, but bear with me… there is some order to it. Let’s dissect how dd will work for us here. sudo — So that whatever you type after this runs with elevated permissions. This requires it. if=/path/to/iso-file.iso — Our “input file”. This is the ISO you torrented earlier, and the full path to it. of=/dev/sdX — Our “output file”, where “X” is whatever letter your computer is calling that thumb drive you inserted. For me, it’s /dev/sdb. Whatever you do, don’t put a number after that, or else this won’t work. bs=1048576 — Specify the blocksize. I’m not going to go into the detail of blocksize performance, and you don’t really have to delve into it much either (though if you want to, there’s a great writeup here on the subject). Well, if you’re already running Linux and following this process, you’ve already got a good idea what to do with this. I keep a thumb drive with LMDE on it in my bag to use as a rescue booter, and it is of course also handy to do an install on a machine that needs some Linux on it. As a bonus, things tend to install faster from USB than they do from an optical drive anyway, and since most machines don’t even have optical drives these days, you’ll go a lot farther with a thumb drive. And now you know your way around dd, at least in the basic sense (and most people don’t need to mess around with it more than that). Never fear the command line! Most commands work a lot like this one, and when in doubt, consult the man page! Instreas of dmesg | tail, you should try lsblk. Hey, good advice! Thanks! I did not know that one. Doesn’t that just copy the ISO file to the thumb drive? Lol, ultra late reply. Yes, if the device doesn’t exist, but otherwise, it does a similar job of dd. The same thing applies if you use the cat command (cat /path/to/iso > /dev/sdX). Boo! All you did was to copy the instructions from latest mint releases, and used that to fish readers. BEWARE! Not all distros can be put on USB like this. Besides, like author states, this wipes all contents, and besides it leaves no extra space available – so if you have a 2 GB stick, then this might be ok, but you really don’t want to waste a 8, 16 or even 32 GB stick like this!! Why I came here and what I expected to see was a guide that mounts the stick and the ISO file, copy files like unetbootin does, and additionally perform whatever rest is it that it does, like creating up to 4GB of persistent storage for Ubuntu based live sticks. Now that guide would’ve had some merit!! So when will you be posting helpful advice instead of whining about what Trent does on his own blog? Very good reply Alan, when will he be helping us aging (75 yrs old) get the hang of linux code?. Well to be quite honest, I use antiX, the distributors of which made a program to enable the writing of USB sticks a couple of years ago.